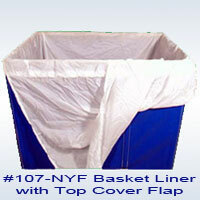 Our nylon laundry basket liners are available with a flap and designed to fit within your open cart. The attached flap is placed over the top to keep protect contents. Made of heavy duty 200-denier white nylon. Easily laundered. Custom sizes, colors and materials available.